the SHPF Emergency Parachute System (EPS) repack event is going to be held at the EICA, Ratho on the 2nd of February 2019 from 09:30 until 18:00. Unfortunately the zip line won't be in operation due to the installation of a new climbing wall structure at Ratho. Hopefully a suitable venue, where a zip line can be set up, will be found for future events. Richard Bungay (UK Airsports/BHPA licensed packer) will be available to provide repacking assistance and advice on all things EPS. Experienced repackers will be available to assist with repacking and fitting reserve parachutes. 2 x harness hangers will be set up, which can can be used to set up paragliding harnesses. Catch up and have a chat with your flying mates. 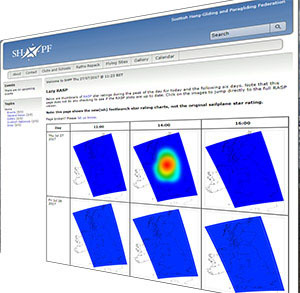 Pricing: SHPF members £15, non-members £20. The 'Lazy RASP' overview page is now here on the SHPF site. Click here to check it out. Information on flying at Hillend and the Pentlands is now available here on the SHPF site. 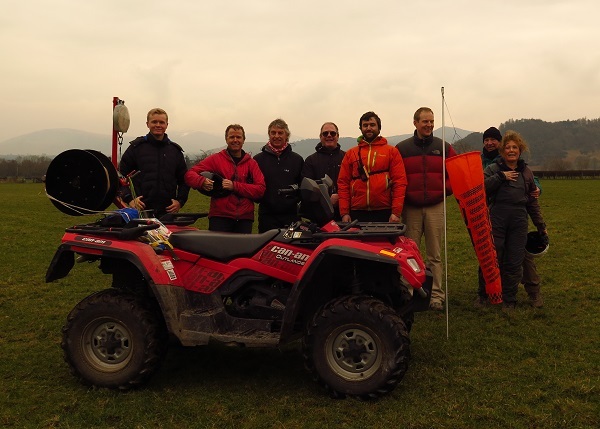 A successful day was had by all attending the first weekend of the SHPF-supported tow rating conversion course at Jocky Sanderson's airpark near Keswick. Thanks to Sean Figgitt for organising - its good to see all the effort finally paying off. The 2014-15 SHPF XC league ended on Saturday! Congratulations to Brendan Reid who won with 757 points. 2nd was Matthew Church with 637 points, and third was Julian Robinson with 395 points. Matt also had the longest open distance flight with 118.5 km on 11th June from Beinn Leabhainn to Deeside. Of the clubs, Brendan Reid won from the LLSC, Matthew Church from the Aberdeen Club, Mark Robson from the Highland Club and Tony Shephard from the SMPC. The longest LLSC flight (105km) was won by Stewart Reid - the first time this has been achieved by a hang-glider in some time! 34 people entered flights. Details of all the flights can be found on the XC league website. The winter league has already started, and will run until 31st March. Good luck! The current results for the 2015 nationals series can be viewed here.